Lightly grease 4 6-oz. ramekins and pre-heat oven to 350 degrees. 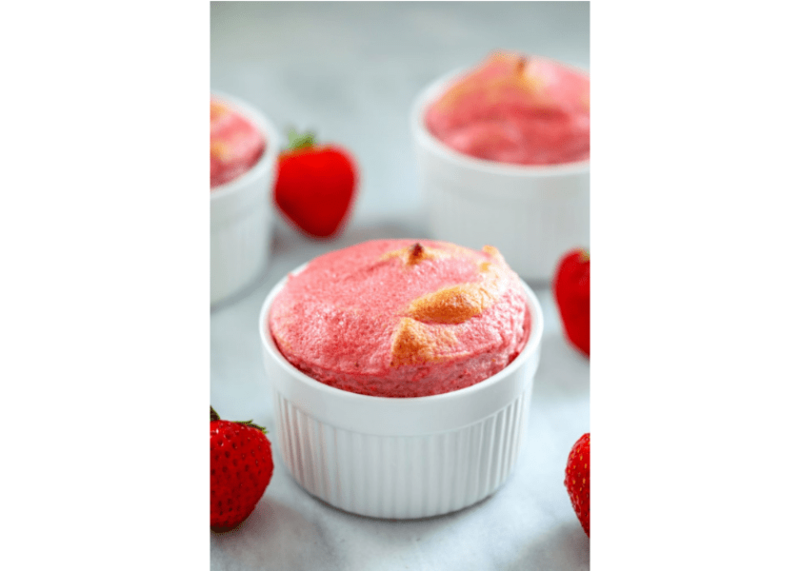 Place strawberries in blender of food processor and puree until smooth. You should be left with about a cup of liquid. Blend in sugar and vanilla extract. In a large bowl using a hand mixer, beat egg whites until medium peaks form (in between soft and stiff). Fold strawberry puree into the egg whites. Divide mixture between ramekins and place each on a tray so you can easily transfer them to the oven. Bake for about 15 minutes, until souffles have risen and are turning golden brown on top. A toothpick stuck into the souffle should come out clean. Serve immediately as souffles will begin to fall quickly.